Malta has recently started attracting international companies involved in the digital gaming industry. This is an ever growing industry with many young entrepreneurs launching their games and seeking an ideal business environment and corporate vehicle to help them maximise their returns. The worldwide games industry was valued at $49bn in 2010 which more than doubled in 5 years, due to substantial growth in both retail and network gaming. 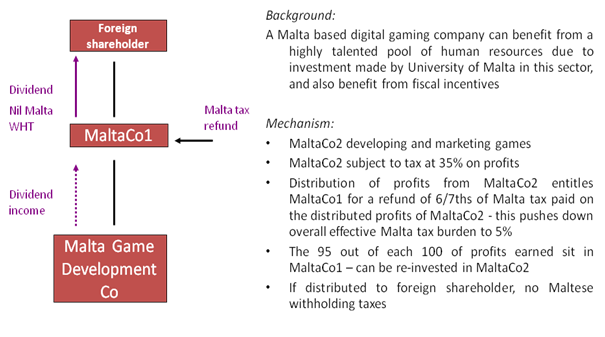 (b) Possibility of cash grants under the Malta Digital Games Fund. The minimum grant for project support is €15,000 up to a maximum of €40,000. Grants awarded may amount to not more than 75% of the eligible development cost of the project and are intended to stimulate the realisation of projects. (c) Professionals working with digital gaming companies earning a minimum salary of EUR45,000 per annum are eligible for a flat rate of personal tax of 15%. Persons eligible for such rate include game developers and designers, digital artists, etc. (d) The University of Malta set up the Institute of Digital Games in 2013 to deliver world-class, postgraduate education and research in Game Studies, Game Design and Game Technology. The University of Malta also offers an incubator for start-ups in this sector.